Visit the largest French Speaking city in the world after Paris (Montreal) and the only walled city in North America (Quebec City) which has a distinguished European look and feel. This is truly a unique culture of 7.5 million people located on an island surrounded by a sea of more than 300 million English speaking North Americans. Arrive at the Delta Montreal Hotel by Marriott in the very heart of the new and vibrant Entertainment District of Montreal. The hotel is within walking distance to trendy restaurants, shopping, museums, Sherbrooke Street and Mount Royal. Check in and take the evening to explore and dine on your own in Montreal. 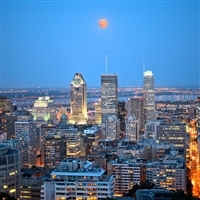 Enjoy a full breakfast at the hotel and depart for a morning city tour of Montreal with a step on guide. See Place Ville-Marie, where the underground city began, Notre Dame Cathedral in Old Montreal, Olympic Stadium, Mount Royal and St. Joseph's Shrine. Group will return to the hotel for some brief shopping and lunch before departing for Quebec City, and the Hotel Palace Royal. The Hotel is located 100 yards from the Old Walled city of Quebec. Check-in, meet your group representative and enjoy dinner on your own. Enjoy a full breakfast at the hotel and depart for a tour of Ste. Anne de Beaupre and Quebec City includes viewing the Plains of Abraham, and the Citadelle, the narrowest street in North America. You'll explore the mysteries of North America's only walled city. Arrive at Montmorency Falls, which are 1.5 times higher than Niagara Falls and were the first to be used for hydro-electricity in Quebec. Visit the copper studio, then travel a lovely road leading to a bread oven and stone dwelling dating back to 1650. It now houses the fourth generation of the French-Canadian Marie Family's Bread Oven. Next, arrive at the Wood carvers Museum for an introduction to Quebec legends presented by one of the workshop animators, then head to the famous Ste. Anne de Beaupre Shrine to finish off the morning. Enjoy lunch on your own in Quebec City before embarking on a city tour with guide. Return to the hotel to freshen up for an included dinner in the hotel dining room. Enjoy a full breakfast at the hotel before departing for home. Deluxe Motorcoach Transportation, One night accommodation at the Delta Hotel in Montreal, Two nights accommodations at the Palace Royale in Quebec City, Guide service and tours of Montreal, Ste. Anne de Beaupre, and Quebec City, all attractions including Notre Dame, Marie's Bread Oven, Ste. Anne, etc., Three breakfasts, and one full dinner.